I thought of Meridian’s concept while on my bicycle, and I said to myself, ‘what if a messenger bag’s strap could be converted to wear on both shoulders?’ It was in that moment that the idea for the Meridian bagpack was born. Today, Hillside Industries has launched the world’s first convertible messenger bag and backpack that allows for transition to either style without taking the bag off. 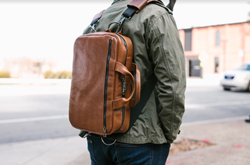 With a funding goal of $30,000, the Meridian bagpack is now available for pre-order on Kickstarter. Meridian’s patented, continuous-strap design makes it possible to retrieve items from the bag without having to take the bag off, which keeps belongings safe and accessible at all times. This continuous-strap system can be adjusted to sit on one shoulder or evenly distribute weight on both shoulders to reduce back and shoulder strain. When wearing two straps, the weight is auto-balanced between both shoulders to create a floating effect, which prevents “jerking” from left to right when running or walking and provides convenience, comfort and therapeutic relief. Additionally, the bag’s handle allows for a convenient grab-and-go briefcase style as well. Weighing just two pounds, the 16-inch bag remains lightweight and has a main compartment that includes four internal organizing pockets, a neoprene sleeve for electronics or notebooks, and a zippered privacy pocket. Meridian bagpacks have the perfect number of chambers to keep tablets, notebooks and other belongings organized and safe. The bag is also equipped with a padded and zippered TSA laptop compartment that fits a 15-inch laptop. Starting at $99, and available in brown full-grain leather, black full-grain leather and graphite poly coated nylon, the Meridian bagpack eliminates the daily struggle of locating things in a hurry and finding the perfect bag to match an itinerary. To order, visit pr.go2.fund/meridian.